White Fantasy Granite White Cabinets Backsplash Ideas is pretty fashionable concept in kitchen remodeling. Since it is new, the number of pictures of White Fantasy Granite White Cabinet Backsplash Ideas is not enough to give a nice perspective. Some pictures are very confusing to identify the White Fantasy; some pictures are made of graphically. By reading my article, you do not need to surf on the pictures and spend time. I am aiming to bring the matching pictures and to enlighten your backsplash ideas. As my other related articles, the name and the characteristics of the backsplash, the color and stain of the white cabinets will be emphasized. In White Fantasy Granite White Cabinet Backsplash Ideas, the backsplash colors are usually in white and very light gray and blue tones. Backsplash color selection is such a fun for White Fantasy Granite. If you would like to see the black backsplash to make enough contrast or full high backsplash you can check out my White Granite Looks Like Marble: White Fantasy Granite article one more time. The material for the backsplash can be ceramic, glass, marble, brick or White Fantasy Granite herself. The type of the backsplash tile would be subway, matchstick, 4×4 Square, 9×18 rectangle and mosaic. Picture Credit:Suburban Dream Homes. White Fantasy with sea pearl with light gray glaze white cabinets and Hampton Carrara Smooth Rectrified matchstick backsplash. Dare to have design. 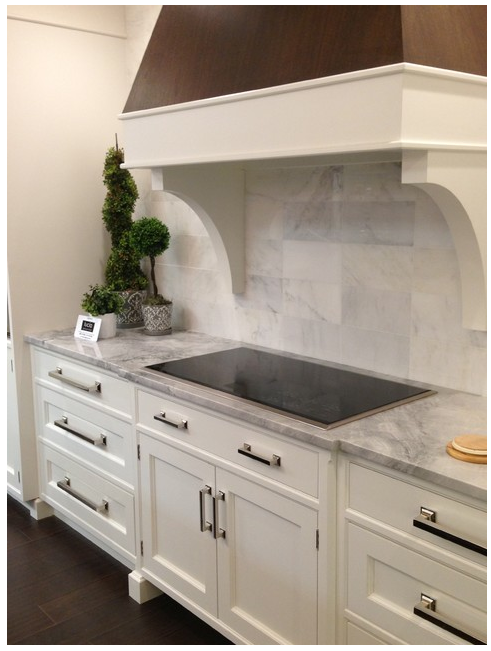 White Fantasy Granite with White Carrara Marble Standard Subway Tiles and White Cabinets and Stainless Steel Appliance. Light Oak Hardwood Ceiling and Recess Lights are Bonus. Picture Credit: Affinity Granite North Atlanta. White Fantasy Granite goes always very well with White Carrara Marble Backsplash.In here, subway tiles are used in two different ways, on is standard tiling other is mesh woven. White cabinets and light oak ceilings with recess lights and medium oak hardwood flooring complete the nice view. White Fantasy with Untinted White Cabinets and White Brick Backsplash and Dark Hardwood Floor. Picture Credit: Novel Painting Solution Inc. White Fantasy island and counter top with untinted White color cabinets . The bricks looks like subway tile and it is such a nice idea to paint them white. Very authentic and creative design. I like the dark hardwood floor, dark stools, customized cabinet refrigerator doors and pendants. Ceiling and recess light are very good choice for this kitchen. Magnificent looking kitchen. 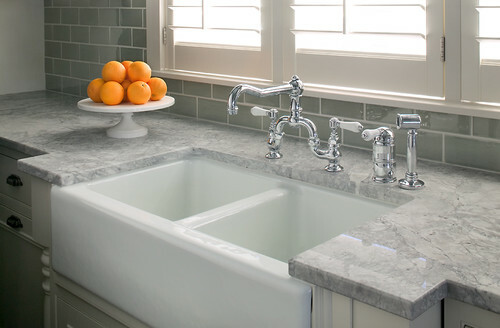 Picture credits:Marble and Granite Inc., The tile size not standardized in kitchen backsplash design. 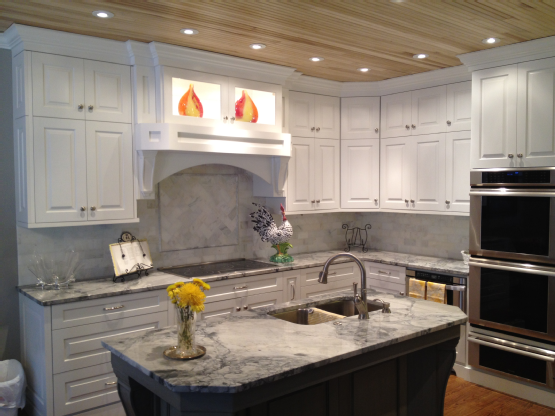 This white carrara marble is 9×18 and shows very well the beauty of white fantasy granite with off white cabinets. Detailed carpentry in hook top is a bonus.Such a nice example of white fantasy granite white cabinets backsplash ideas. If you drop your comments and pictures about White Fantasy Granite White Cabinets Backsplash Ideas and make my blog more loveable, that would be great. I am looking forward to hearing you soon.